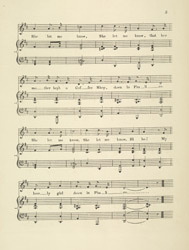 Comic songs were often performed as mock advice for gentlemen, warning them of the dangers of falling in love and trusting innocent looking girls. This song tells the tale of a young girl whose mother owned one of the fashionable coffee shops in Pimlico. After being introduced to her, the girl's mother decides he can move into one of the rooms that they let out. However the bailiffs arrive and confiscate all his belongings leaving him penniless and homeless. Audiences would have been familiar with songs like this and would have laughed at his misfortune.